One of the specific challenges facing the video broadcasting world is to deliver high-quality video content in 4K and 8K formats from point A to B at significant distances. Since transmission bandwidth of a certain link is fixed, say cable or cellular network, it’s required to push more and better quality video data to consumption devices like TVs, tablets, and smartphones. An important solution is High Efficiency Video Coding (HEVC) products, which double the compression ratio and enable 50% or more in bandwidth savings compare to today’s H.264 format. Various technologies improve video consumption experience, including High-Dynamic-Range (HDR) encoding, statistical multiplexing (StatMux), and Adaptive Bit Rate (ABR) encoding. Consider this scenario: a live event is being captured by a 4K (or higher) production camera, and on the other end, we need to efficiently bridge the video content delivery from end-to-end. The figure shows how encoding and decoding technologies and products can enable this advanced capability. Starting from the source is the news van with a high-performance encoder built into its equipment, which is capturing the live video footage and up-linking the HEVC content to the satellite. A Socionext encoder can compress a 4K 60P real-time HEVC video using only a quarter rack unit. To do this requires just 8 W, which can be a 90% power saving compared to similar solutions. In addition, the single channel HEVC content is transmitted using only half the bandwidth required with the conventional H.264, 7.5 versus 15 Mbits/s. 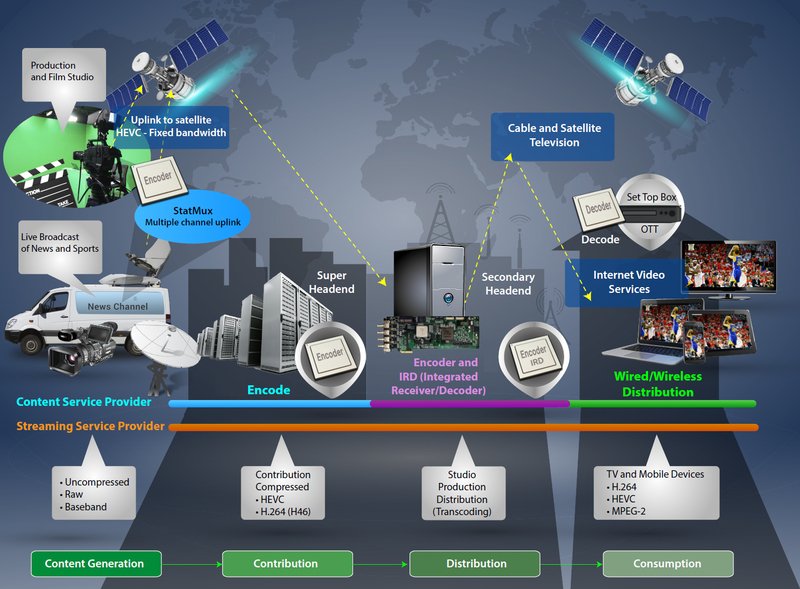 Also, statistical multiplexing software can analyze video streams and maximize bandwidth allocation so that multi-channel content can be uplinked simultaneously to the satellite. Such a simultaneous uplink saves broadcasters time and money as opposed to relying strictly on the constraints of the uplink bandwidth. After the super head-end facility downloads the content, it’s edited and encoded using a HEVC video encoder. The content may go to a secondary head-end where transcoding takes place using an encoder and IRD (integrated receiver/decoder). When the video is ready for delivery, it’s then transmitted via cable, satellite TV or live media streaming. Media streaming service providers such as Amazon, Netflix, and Hulu, as well as cable networks, can further process the content using new generations of codecs. Finally, it’s delivered to end customers. Most broadcasters envision a steady evolution from HD technology through 4K and onto 8K in a relatively compressed time period. Anthony Wong is a Director at Socionext America, where he’s responsible for businesses focused on imaging and visual systems solutions. Anthony has dual Master’s degrees with one in Electrical Engineering from The Chinese University of Hong Kong and another in Enterprise Management from Hong Kong University of Science and Technology. Anthony Wong, Socionext America, Inc.